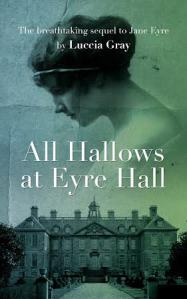 “All Hallows is believable and well-written, true to the “voice” of Brontë, and well-researched. In fact, at times I thought Charlotte Brontë was writing this; that is how fabulous a writer Luccia Gray is. This is not to say that she is a copy-cat writer. No, the author understands and “gets” the flavor, feel, and construction of Brontë’s work – an honor to a classic author, and thus, that is how sequels should be written. Bravo! Early into my blogging career I met a lady who was a bit different than the norm I had become accustomed to up to that point. Oddly since meeting her I have begun to meet other very intelligent and classy people. When she showed an interest in my blog it was a thrill for me that such a talent and such a lady had done so. Her style and interest is unique among the people I am familiar with and that adds something to the overall mystique about her. She will disagree about a mystique but then again she would disagree if you said she was a talented writer. Meet . 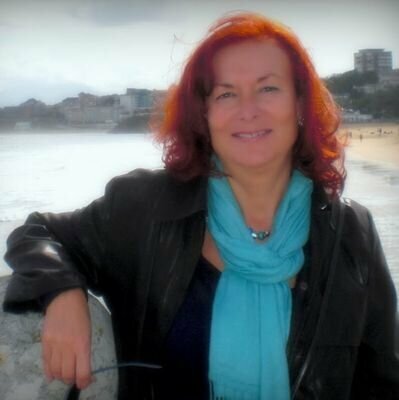 . .
LUCCIA: I was born and brought up in London, although I live and work in the south of Spain. LUCCIA : My favorite authors are like my best friends. I’ve known them for years, and I can’t live without them, so I go back to them time and time again. They are always comforting and helpful whenever I need inspiration or escape. The first is William Shakespeare, because I’ll never tire of rereading his plays, sonnets and long poems. Secondly novels by Charlotte Bronte, Charles Dickens, or Wilkie Collins, are never far from my fingers. LUCCIA: During the day tea, coffee and orange juice. In the evenings, white wine on occasions. LUCCIA: I love words like; enraptured, mesmerized, cherished… because they convey powerful, singular feelings, and they also roll easily off the tongue, and sound wonderful when spoken. So they’re great for reading and speaking! LUCCIA: I’ve been a writer as far back as I can remember. I need to read and write like I need to eat and drink, but I try hard to rationalize the urge to ‘pour out my soul on paper’, and write something worth reading by others. Academically, I have a degree from London University in modern languages, and a PhD in English language teaching methodology from the University of Cordoba in Spain. I teach English language and literature at the University of Córdoba, and at an Adult Education Centre. LUCCIA: It’s a neo-Victorian gothic romance. LUCCIA: It’s about the personal, social, and emotional challenges Jane Eyre faces in her forties, after a twenty-two year marriage to Edward Rochester. Jane is coping with the imminent death of her bedridden husband, while Richard Mason has returned from Jamaica, revealing unspeakable secrets once again, and drawing Jane into a complex conspiracy, which threatens everything she holds dear. LUCCIA: Many people ask me this question, and there is no easy answer. The creative process is a mystery, however, I’ll try and verbalize how I came to write my first novel. I had always wanted to write a novel. I had started many, and even finished one or two, but I was never fully satisfied, because I always seemed to end up writing about myself and my life, and I didn’t want to ‘write as therapy’, at least not so blatantly! I wanted to write a novel that wasn’t about me or anything related to my life. I purposefully moved as far away as possible from myself physically, temporally, geographically, and emotionally. Jane Eyre had been one of my favorite novels since adolescence, and when I read Wide Sargasso Sea by Jean Rhys, as an adult in my 30s, many years later, it struck a deep chord, causing an emotional and intellectual earthquake. My perception of Jane Eyre, and even life, changed drastically. I must add that Victorian literature has always been my preferred reading, but I had never imagined I could write about the 19th read the neo-Victorian novels by A.S. Byatt and Sarah Walters, such as, Possession, and Fingersmith, and I realized that was the type of novel I wanted to write. The seed was sown. In the last five years, I was asked to lecture on a subject called ‘Postcolonial’ or ‘New’ Literatures in English, at the University of Córdoba, where I live. After an overview of theoretical and ‘Colonial’ aspects in Victorian literature, the next topic I chose to deal with was ‘writing back’ and ‘rewriting’ colonialism by modernist or 20th authors, such as Jean Rhys. So we compared the themes and characters in Jane Eyre and Wide Sargasso Sea. This topic led to more research and brought up lively conversations in class. The seed grew. It grew so much, I had to get it out of my system and write a novel. A novel that would merge both Jane Eyre and Wide Sargasso Sea, taking both their plots and characters as my background, and moving on to write a sequel of the merger I had created in my mind. The catalyst is Annette Mason, Bertha’s daughter. She will bring both women together, a generation after Bertha’s death. RW: Tell us about your main character and what you think will them connect to readers. LUCCIA: My novel has multiple narrators, and there are several significant characters, but overall it’s the story of Jane Eyre’s maturity. Bronte’s Jane Eyre portrayed Jane’s ‘coming of age’, remember she was only 19 when she arrived at Thornfield, and she married Rochester a year later. In my novel Jane grows up, and becomes a mature adult. It could have been called, ‘Jane Eyre Grows up and Gets on With Her Life’, but that wouldn’t be very appealing to readers! I think my Jane is an adult, not a love-struck teenager. Although in many ways she’s very much a Victorian woman, she is socially conscious, and is especially keen on promoting free and universal education for all children, especially orphans. She is century to a contemporary audience, until I obsessed with her son’s future in Parliament, because she would like him to promote the social change she feels is needed in Britain. She has published a successful novel, and practically runs the estate, as her husband is on his death-bed, and has been bed-ridden for some years. However, Jane is not perfect, far from it. She is controlling, obsessive, stubborn, and a little scheming (she learnt that from her husband!). Although she is still a young and passionate woman, she will stop at nothing to achieve her goals, even if it means sacrificing her own love, and expecting others to do the same. She is too concerned with social conventions, and in some ways, she has evolved into the woman she would never have wanted to become. Naturally, she will continue evolving the in sequel, Twelfth Night at Eyre Hall. RW: Who would play your main character in a movie? LUCCIA: I think I’ve seen all the movies and series based on Jane Eyre. My favourite Jane Eyre is definitely Ruth Wilson in the 2006 BBC miniseries. http://www.imdb.com/title/tt0780362/ She’s only 32, so she’s a little young to play my Jane, at the moment, but by the time my novel becomes a film or TV series, in a few years, she’ll be the perfect age! I was tired of watching weak, school-girlish Jane’s in other versions. I need a more empowered rendering of Jane for my novel. LUCCIA: The most powerful message is that a great novel, like Charlotte Bronte’s Jane Eyre, allows you, no, begs you to look beyond the surface of a novel and search for the real story. Readers should read between the lines, look for the secondary characters, see beyond the narrative ending, and recreate the novel in their own minds. Reread, reinterpret, and reassess what you read and what you believe. LUCCIA: Mind-blowing for readers who are familiar with Jane Eyre, because it challenges what readers thought about Jane Eyre and Rochester, especially if they’ve read the book or seen the film. Captivating for readers who haven’t read the book or seen the film, because they will enter the fascinating world of Jane Eyre for the first time. LUCCIA: At the moment it’s only available on Amazon kindle. I also have a Facebook Page . LUCCIA: I am a one-woman-show at the moment! I’ve never had an agent, and I’m not even sure what they do. However, as I’m finding the whole publishing business rather daunting, ideally I’d like an agent to handle advertising, deal with financial aspects, legal aspects, liaise with my publisher, and everything else that takes my mind and time away from writing. I’d like to keep control of things like my book cover, the content of my novel, my writing schedule, and my social media. LUCCIA: I’m writing part two of The Eyre Hall Trilogy, Twelfth Night at Eyre Hall, which I hope will be published on Twelfth Night 2015! LUCCIA: I read several books at once. I’m not sure why I do it, but I’ve always done so. When I used to read hard copies, I’d read two or three books at a time, taking up each one according to my mood. Now, I read even more books at a time, because I download them and start them on my Kindle, and continue as I have time, again depending on my mood. I make a point of rereading the classics continuously. Hardly a week goes by when I don’t reread parts of Jane Eyre, Great Expectations, The Woman in White, and so many more, depending on my mood! Regarding new books, I’m making a conscious effort now to read mainly contemporary authors, preferable debut and self-published books, or those published with small publishing houses, because they (as I do) need the support to continue creating, and I think that’s where the future of publishing is. I love thrillers, romance, and historical novels. In the last two weeks or so, I’ve read thrillers like Mad Dog House and Mad Dog Justice by Mark Rubinstein, Cold Blooded by Matt Cairns, and Kiss Me When I’m Dead by Dominic Piper. I’ve also read a Victorian romance by Frances Evesham, An Independent Woman, and I’ve just finished reading a contemporary romantic thriller, Before the Dawn by Georgia Rose, which is the sequel to The First Step. LUCCIA: You can write alone, but you can’t publish alone. Write and rewrite until you’re happy with the final version, get beta readers, and friends to read it, rewrite and correct again with their suggestions. After that, get a professional editor and/or proof reader to go through it again, reread one more time. When you’re happy with the final version, then format for Kindle, or wherever you’re publishing, get the cover done by a professional, and do all the paperwork involved. Then promote your book on social media, interact with other writers and readers on your blog and twitter, at least. This whole process took me a year, but I have a family and a job, it could take less if you focus 100%, but, it takes a long time. RW: If you could have written any book that exists, other than your own who’s would it be and why? LUCCIA: Rebecca by Daphne du Maurier. Why? It’s one of those books which become classics because they’re both literary fiction, and mass market fiction. Although I love Victorian fiction, I’m aware that it isn’t easy to read for contemporary audiences (three volumes, pages of descriptions, too much telling and not showing, etc…) I wouldn’t like to write a book written only for people who read the TLS. I’d like to write a well-crafted book that readers of all ages and interests can read, and I think Rebecca fits the bill. It has romance, passion, unexpected twists and turns, mystery, beautiful settings, enigmatic and authentic characters, and it’s masterfully written with elegant and flowing prose. That’s the type of book I aim to write. LUCCIA: When I get frustrated or stuck while I’m writing, I have many resources to snap out of it! Sometimes it takes hours, and others a day or two. Sometimes I just need to do something with my hands, such as cooking or gardening, or something physical, such as going for a walk or swimming, while thinking about my novel and the place where I’m stuck. Other times I sit and reread any of my favorite Victorian authors, that usually gets me back in the mood with new ideas. I don’t fret, because I know it will be all right in the end. Often I wake up with a solution or idea, because my subconscious has been busy working it out while I was sleeping. RW: Tell us where everyone can find you. You may have not read her book yet, but after reading her answers today you can see what I was talking about in my introduction. She knows her subject and she has a heart for it that makes her one unique person to write the story she has. I want to thank Luccia for this interview and I hope to have her again for her next book release. Buy her book, and follow her everywhere. And remember, when you read a book, write a review on one of the sites where you purchase them. Great guest, Ronovan. I also love Jane Eyre and came across Jean Rhys through another novel but had to go back and read White Sargasso Sea. Fascinating topic and the novel sounds fantastic. Good luck! Great guest, Ronovan. I also love Jane Eyre and came across Jean Rhys through another novel but had to go back and read Wide Sargasso Sea. Fascinating topic and the novel sounds fantastic. Good luck! Our friend @LucciaGray has an interview at LitWorldInterviews today. Go check it out and support her. ‘Like’ it. Not for the site purpose but to show her your support. Author’s love their work, but Luccia takes it to a whole new level. You have to read the interview. Thank you for a great interview Ronovan. It was a pleasure to answer your questions and let your followers know a little more about my novel. I have not read this yet, but what a lovely interview of an author. Wonderful interview and not only because I share a love of almost all the same books. I”m looking forward to this one for sure! Wonderful interview! I am following her on pinterest and facebook! Thank you! Really fascinating to read about Luccia’s novel and her writing process. The book sounds appealing and intriguing. Great interview! Luccia does know how to give some great answers. A very classy lady. Thank you. I was honoured and fortunate enough to have my interview with Ronovan published yesterday in his amazing and supportive Blog, Lit World Interviews. Thank you so much for a great interview Ron! Hope you all enjoy it! Great interview and thank you for bringing Luccia Gray to my attention. For most of my life, I thought the ‘mad woman’ was the most interesting character that was not developed, and, having a colonial past myself, was delighted with Wide Sargasso Sea. I’ll be looking out for Luccia’s books, and hope that they do, indeed, become movies. Great choice of Ruth Wilson, Luccia. Such talent. I loved her performance in “Luther”.